the table and BetVictor make both sides the 11/4 joint-favourites for the title with the Hatters 4/9 to seal back-to-back promotions and be playing League One football next term. With difficult games for Wycombe (7/5 favourites at home to Southend) and Shrewsbury (23/20 favourites away at Cambridge) Luton have a terrific chance of moving into top spot when travelling to Morecambe on Saturday; Town 23/20 favourites with BetVictor, the hosts’ 13/5 and the draw 12/5. The foundation to Luton’s ascent up the table has been their solid back-five and that can see them to another precious three points; 12/5 to win to nil and 7/1 to win by the solitary goal. Meanwhile, Lutons have their name in the hat for the third round of the FA Cup however an injury-time equaliser from Daniel Nardiello earned the Shakers a replay and they head to Kenilworth Road midweek with their own hopes of cup success alive. 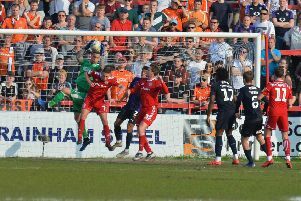 Manager John Still spoke of his pride at earning a replay, notwithstanding the late equaliser, however Luton have to break a 52-year record against Bury, not tasting success over the Lancashire outfit on home soil since December 1962! Nevertheless, BetVictor make Luton the 4/5 favourites to advance to the 3rd round and even money favourites to break a 50+ year hoodoo and get the job done in the 90 minutes and claim a sixth consecutive win at Kenilworth Road. Bury are 9/4 to win without the need of extra time or penalties and 11/10 to move onto a 3rd round tie with either Cambridge or Mansfield however the Hatters should be able to get the job done rather comfortably; Luton 3000/1 with BetVictor to be lift silverware at Wembley in May.